Roughly 20 pieces of clothing per person are manufactured each year. Growth of the multi-trillion-dollar apparel industry has been fed by “fast fashion,” which makes clothing cheaply and quickly with a low price-tag. 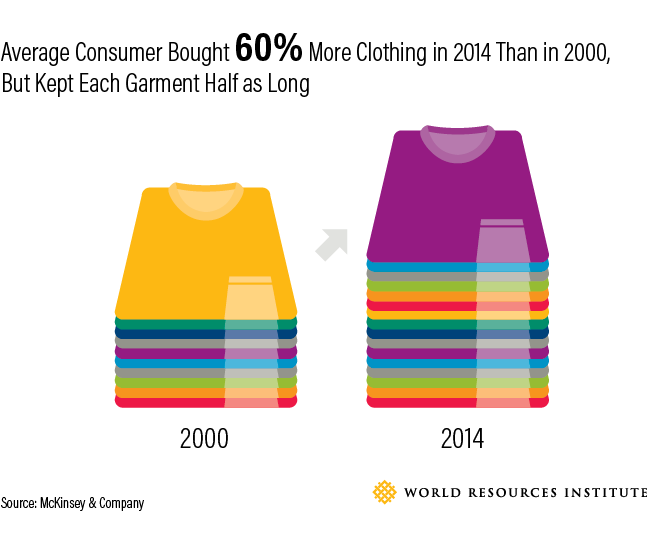 These visuals illustrate why the apparel industry must embrace a new approach to sustainably meet demand in tomorrow’s markets. 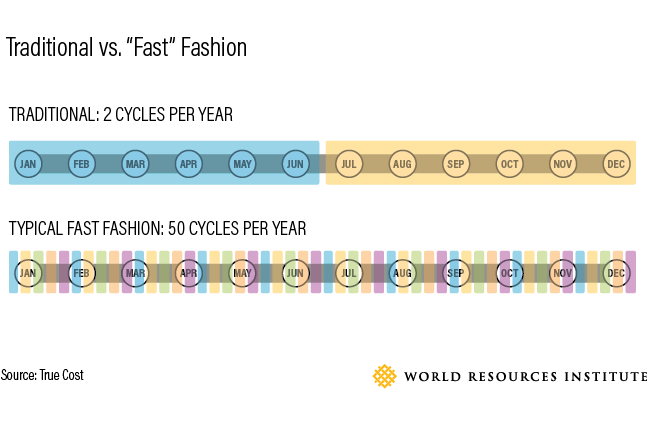 Fast fashion uses innovative production and distribution models to dramatically shorten fashion cycles, sometimes getting a garment from the designer to the customer in a matter of a weeks instead of months. The number of fashion seasons has increased from two a year – spring/summer and fall/winter – to as many as 50-100 microseasons. Fast-changing trends and low prices have allowed people to consume more. The average consumer is now purchasing 60 percent more items of clothing compared to 2000, but each garment is kept half as long. Cotton is the most common natural fiber used to make clothing, accounting for about 33 percent of all fibers found in textiles. 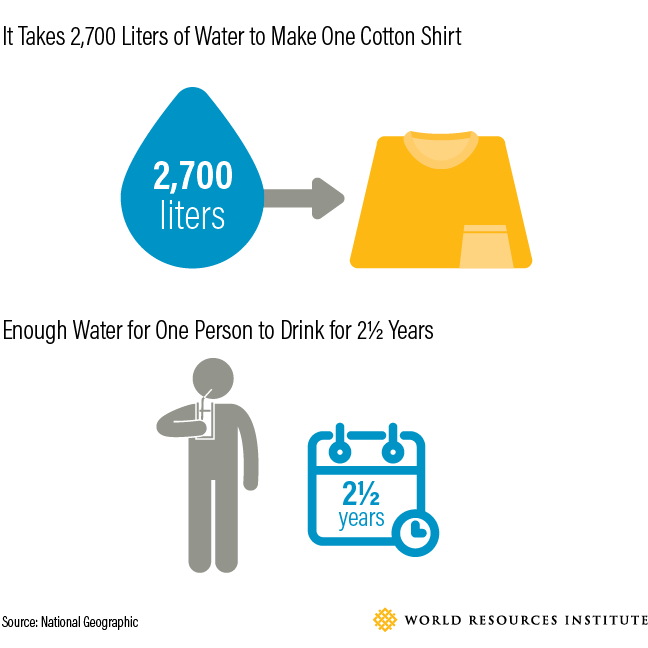 Cotton is also a very thirsty crop, requiring 2,700 liters of water—what one person drinks in two-and-a-half years—to make one cotton shirt. In areas already facing water stress, cotton production can be particularly damaging. In Central Asia, for instance, the Aral Sea has nearly disappeared because cotton farmers draw excessively from the Amu Darya and Syr Darya rivers. (Check out WRI’s Aqueduct tool to see where cotton production and water risks intersect.) Cotton farming is also responsible for 24 percent of insecticides and 11 percent of pesticides despite using about 3 percent of the world’s arable land. Water use and pollution also take place during clothing production. About 20 percent of industrial water pollution is due to garment manufacturing, while the world uses 5 trillion liters (1.3 trillion gallons) of water each year for fabric dyeing alone, enough to fill 2 million Olympic-sized swimming pools. The carbon footprint of a garment largely depends on the material. While synthetic fibers like polyester have less impact on water and land than grown materials like cotton, they emit more greenhouse gasses per kilogram. A polyester shirt has more than double the carbon footprint of a cotton shirt (5.5 kg vs. 2.1 kg, or 12.1 pounds vs 4.6 pounds). 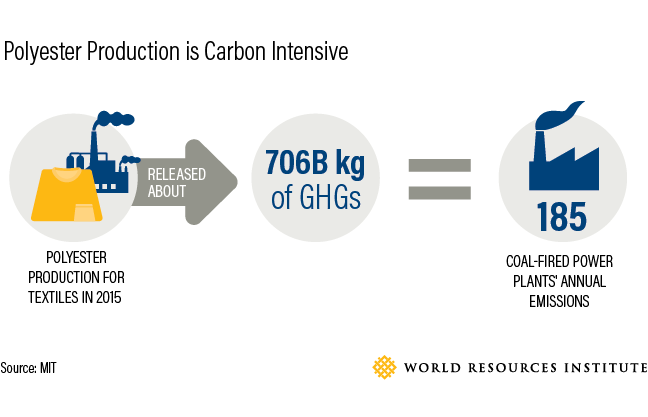 Polyester production for textiles released about 706 billion kg (1.5 trillion pounds) of greenhouse gases in 2015, the equivalent of 185 coal-fired power plants' annual emissions. 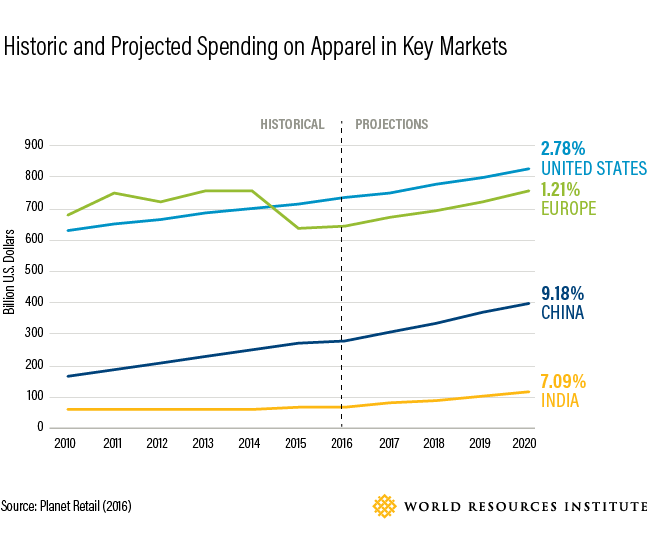 Apparel spending is projected to grow tremendously. This is particularly true in Asia, as hundreds of millions of people in China and India enter the global middle class. By 2030, there will be 5.4 billion people in the global middle class, up from 3 billion in 2015. We can expect increased demand for clothes and other goods that define middle-income lifestyles. 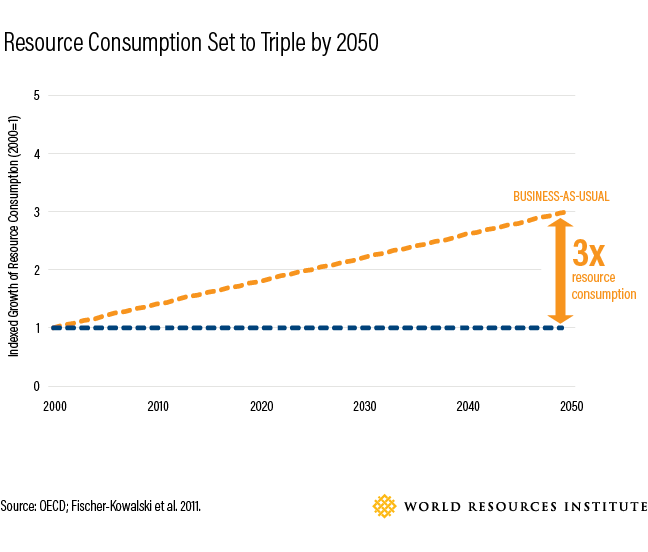 If consumption continues at its current rate, we’ll need three times as many natural resources by 2050 compared to what we used in 2000. Assuming infinite resources in a finite world is not a sustainable business model. Beyond environmental concerns, unchecked consumption will undermine the world’s economic and social goals. Some apparel companies will ignore those signals and continue with traditional take-make-waste business models. Others will embrace innovative new models that work within planetary boundaries and are a better fit for tomorrow’s markets. Apparel is just one sector competing for natural resources, but it’s important that clothing makers start transforming their business models now given the industry’s strong growth trajectory. Many companies are aware of the environmental risks and are ready to act. The first step is for companies to measure their environmental impacts and understand areas where they can improve. The Sustainable Apparel Coalition’s Higg Index lets companies measure the environmental, social and labor impacts of their products and services, and work is being done on Science Based Targets guidance for the apparel industry. Some companies are working to improve their resource efficiency. H&M and Zara, both purveyors of fast fashion, joined 33 other fashion companies in a pledge to increase their clothing recycling by 2020 and are collecting and recycling used clothing at many of their stores. Reformation, a smaller Los Angeles-based clothing brand that is gaining popularity, claims that it produces its clothing with far less water and emissions than typical clothing companies, and even publishes the spared water and emissions quantities on each product webpage. The next step is to recognize that companies must do more than improve efficiency to sustainably meet demand in the years ahead. They must produce less stuff. Some companies have already acknowledged this and are testing new models, though these examples are still the exception rather than the rule. Patagonia’s Worn Wear program offers a service to fix old clothes rather than only sell new ones. Companies like Mud Jeans, Rent the Runway and Gwynnie Bee are experimenting with rental models. Some companies, such as Zady’s, are calling for a return to “slow fashion,” promoting it as a key component to their business model. To keep the apparel industry viable in tomorrow’s markets, the issue of consumption must be brought to the forefront—and it must begin now.